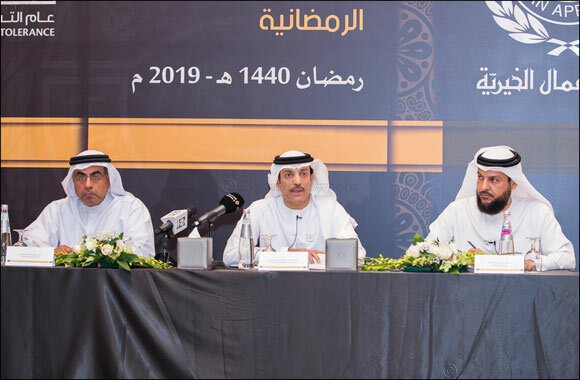 Dubai, UAE, March 25, 2019: Human Appeal International in Ajman announced launching its annual Ramadan campaign for 2019 under the slogan “Your Giving is their Happiness” with the aim to raise AED 250 million, 18% more than the total sum collected last year. The campaign seeks to provide a diverse and comprehensive package of charity projects that deliver aid for needy impoverished families and orphans. The organization aims to raise 60 million AED, recording 11% growth over last year’s campaign. The funds will be allocated as 22,758,853 AED for families in need via Zakat Al Mal imitative; 4¡676¡488 AED for Ramadan Iftar baskets; 1¡136¡366 for Zakat Al Fitr, and 1,100,000 AED for Eid clothing. Public projects will be allocated 22¡833¡128 AED, including schools, mosques, wells, medical centers, bread initiatives, and other public projects. Finally, 7¡737¡686 AED will be allocated to an orphanage project. This came during a press conference at Ajman Saray Hotel, attended by Sheikh Mohammed bin Abdullah bin Sultan Al Nuaimi, Chairman of the Board of Trustees of Human Appeal International and Member of the Federal National Council, directors of state departments, members of the Board of Trustees, sponsors of the campaigns, benefactors, and representatives of media outlets. Mohammed bin Abdullah bin Sultan Al Nuaimi, Chairman of the Board of Trustees and Member of the Federal National Council, said: “This campaign benefits thousands of families. Since Human Appeal International was established upon the directives of His Highness Sheikh Humaid bin Rashid Al Nuaimi, Member of the Supreme Council and Ruler of Ajman, and with the patronage of His Highness Sheikh Ammar bin Humaid Al Nuaimi, Crown Prince of Ajman, it has provided many seasonal, charitable and humanitarian programs throughout Ramadan and the holidays.” He called upon benefactors and those who are able to support the charity work of the “Your Giving is their Happiness” campaign by donating and providing assistance. This is particularly important for this year’s Ramadan, as it falls within the Year of Tolerance. He affirmed the commitment of Human Appeal International to provide assistance and aid to various vulnerable and needy groups both within and outside the country. Such efforts, he noted, are in continuation of the benevolent journey deeply rooted within the UAE, and have helped millions of needy families from all over the world. Its tireless efforts have contributed to putting a smile on the faces of orphans, and to bringing happiness to widows and the elderly. His Excellency said that the charity has completed the first stage of renovating the courtyards and entrances of the mosques of Ajman. He said that their projects, campaigns, and activities focus primarily on the impoverished and needy, with a share set aside for countries that are undergoing exceptional circumstances, in an effort to help achieve the development of needy communities by improving their education, health, social, and economic situation. Such efforts are made in addition to providing relief to communities affected by natural and social disasters, providing the needs of orphans and improving their health, psychological, and social conditions, and improving the relations between the charity and its counterparts around the world to establish the best methods for charity work as employed by other countries. The Chairman reviewed the international achievements, saying they expanded in quality and quantity to provide for those in need, with 18 offices around the world in more than 16 countries. It has also collected around AED 211,187,203 via 1,555 projects—with the distribution of funds allocated to more than 1 million eligible persons around the world in 2018. Services additional provided AED 4,004,105 to local families for house maintenance and repair, the distribution of Zakat, the provision of electricity and health care. Sheikh Mohammed bin Abdullah bin Sultan Al Nuaimi said that in order to achieve its humanitarian goals, the charity launched a number of successful projects including “Sadaqa” which provided aid valued at AED 24,470,371; “Emergency Relief” which provided aid valued at AED 7,966,840; projects for orphans valued at AED 101,355,065; projects for teaching students valued at AED 2,500,000; the “Dirham al-Joud” project valued at AED 1,239,817; “Takaful” initiative valued at AED 3,002,915; Zakat al-Fitr at AED 1,054,368; Iftar al-Sa’em at AED 3,984,158; Zakat al-Mal at AED 20,636,518; charity projects at 42,646,508; Eid clothing campaign at AED 1,104,501; and AED 1,226,142 in sacrifices for Eid—among other donations raised. He said: “The Ramadan campaign is one of our largest endeavors, and preparations for the holy month began early—particularly in keeping in touch with benefactors and with those in need. Such efforts are to encourage UAE citizens and residents to donate so that the charity would deliver their donations to those who need them in the UAE and abroad.” He added that the charity’s work expresses the culture and values and the UAE's people, and bolsters charity and humanitarian work in the country. He said this year’s campaign will vastly differ from previous ones, as it will present a new charity initiative, the “Benefactors Fund,” with the charity and a dedicated workforce to ensure its success. The initiative is based on starting an account for the benefactor or company based on the philosophy for providing support while searching for those in need so that they can receive help, particularly those who have critical medical conditions that cannot wait. He said the fund works by having benefactors or establishments deposit the funds they allocate for supporting the poor in their accounts at the fund. Cases referred by the qualified social research team are studied, and when a case is deemed deserving of aid, a sum is then provided, saving time and effort. The campaign’s targets for the first half of 2019 is to have 20 accounts for establishments and individuals at an average of AED 300,000 per account, for a total of AED 6 million. During the press conference, His Excellency announced the launch of the new brand of the Human Appeal International website, to keep up with the aspirations of the benefactors, donors, and employees according to modern and innovative technical bases. The site’s advancements serve the interests of the clients, keeping them up-to-date via the new site or via their mobile devices. For his part, Dr. Khalid Abdulwahab Al Khaja, CEO of the Human Appeal International, called on benefactors who wish to donate to wire funds either via SMS, or via the charity’s bank accounts, e-payment methods, the dedicated link for direct donations (www.hai.ae), or through direct donations to the charity’s authorized representatives. Al Khaja stressed that helping others reflects the noble and humanitarian values of mankind. Al Khaja pointed out to the most prominent projects of the charity, which are classified by their humanitarian goals and have produced amazing results in 2019. These charities include: the project for combating poverty valued at AED 134,147,176; the project for combating hunger at AED 24,872,359; the community happiness project at AED 35,420,135; the good education project at AED 5,063,934; and the good health and water project at 11,386,669. He added that projects are implemented in accordance to the designated funds for various programs: social programs receive 87% of overall projects, while the health project receives 5.4%, the relief program receives 5.2%, and the education program receives 2.4%. In 2018, 1,012,875 people have benefited from these programs. The CEO said that the “Your Giving is their Happiness” Ramadan campaign is part of the charity’s commitment to helping those in need and to aiding in their happiness. He asserted that it has succeeded during the past years in accessing a large segment of eligible people through its Ramadan campaign, and that this campaign is a source of pride for the Human Appeal International. He thanked all of the campaign’s sponsors—companies and individuals, who donate to help the charity’s projects. Al Khaja pointed out to the achievements of Human Appeal International, including the smart collection system launched last year—the first of its kind in the UAE. The system, which launched the charity’s website and approves its Institutional Identity Guide, facilitates the work of employees who collect donations using digital coupons, making the process easier and more credible for donors. Human Appeal International in Ajman was established in 1984 with a decree by His Highness Sheikh Humaid bin Rashid Al Nuaimi, Member of the Supreme Council and Ruler of Ajman. It has had an impressive presence in the field of charitable and humanitarian work locally, regionally, and internationally. It has received advisory status in the UN Economic and Social Council (ECOSOC), permanent membership of the International Islamic Council for Da'wah and Relief in Cairo, observer status in the International Fund for Agricultural Development (IFAD), membership of the International Council of Voluntary Agencies, and has signed many agreements and memorandums of understanding with international organizations such as UNHCR, UNICEF, and WHO.